Spaghetti with Tomatoes, Black Olives, Garlic, and Mozzarella Use 3/4 pound fresh mozzarella cheese, cut into 1/4-inch pieces, in place of the feta. 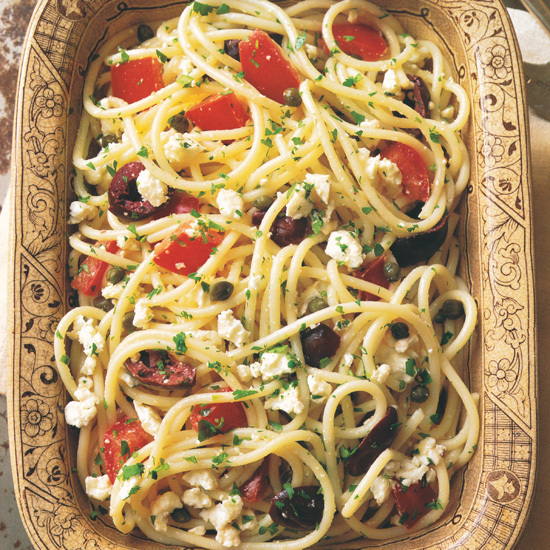 Spaghetti with Tomatoes, Olives, Garlic, Feta, and Fresh Herbs Use 1/4 cup chopped fresh basil or 3 tablespoons mixed chopped fresh herbs, such as tarragon and chives, in place of the parsley. The saltiness of the olives and feta cheese and the acidity of the tomatoes make a refreshingly fruity red wine such as a Beaujolais-Villages the perfect thing to serve. Review Body: So delicious. The amount of salt seemed meager for the amount of tomatoes and pasta, but was amply supplied by the olives, capers and the feta. We used a combination of parsley and basil, for a bit more herbal oomph. The tomato mixture (I used cherry tomatoes as they were the only ones ripe enough this time of year) made a lot, so I used a whole pound of spaghetti. Now there is a yummy bit left for another meal. Review Body: This was exactly the base for what i wanted to make. I also used fresh basil but also added some rough chopped artichoke hearts. Deeelish....regular rotation for sure! Review Body: Just made this for dinner. It was so fresh and delicious, I got 2nds and packed the rest for lunches. I added basil and some cooked shrimp over top. I loved the olives and capers. Such a great recipe. Will make again. Review Body: Love, Love this! Taste just like a dish we get at one of our favorite restaurants. Great recipe!! Review Body: Made this for a wedding pot-luck. Trippled the recipe but it does not scale well. Tastes delicious but looks like blank spaghetti in the giant roaster pan. I plan on adding a second jar of olives, and 2x feta and tomatoes.